Now taking pre-orders for Monty Python Fluxx! How does the New Rule "One, Two, Five!" interact with the "Inflation" rule? The card game that changes is changing again! 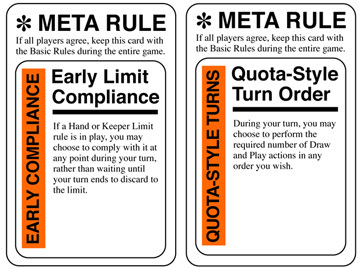 Previously there were only 2 types of Rule cards in Fluxx: New Rules and the Basic Rules. We've had a lot of fun with this structure, but I've come to realize that we need a 3rd kind of rule card, which I'm calling the Meta Rule. Meta Rules are like regular New Rules in that they expand and change the game, but Meta Rules are also like the Basic Rules, because they are played at the start of the game and remain in force until someone wins. Meta Rules are also unique because everyone must agree on including them. Meta Rules are basically formalized House Rules. 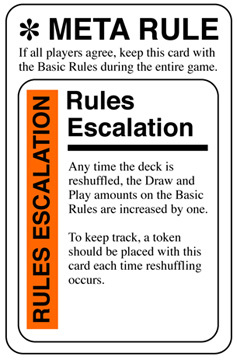 For example, a great Meta Rule is the one shown here, called Rules Escalation. Each time the deck is shuffled, the Basic draw & play numbers are each increased by one. We've been using this rule for the tournaments at Origins since the beginning (Keith Baker came up with this rule when he ran Fluxx tourneys for us at our very first Origins). It's a fun, time-tested rule that we've never been able to officially include in the game before, since we lacked a mechanism for adding a rule that stays in force for the full game. Can you choose to discard to the Hand Limit during your turn? Can you choose to conduct Play actions before Draw actions? Up until now, I've been giving a "Yes" answer to these questions. Now I'm saying "Not without a Meta Rule." Starting with Monty Python Fluxx, and rippling through the other Fluxxes as new printings and editions allow, all Hand Limit cards will henceforth say "This rule does not apply to you during your turn" instead of "You may ignore this rule during your turn." "I can only conclude that the 'may ignore... as long as' wording on the card allows the current player to apply the Hand Limit at any point in their turn they want... even if Andy didn't realize the implications of the phrasing at first." Ultimately, I decided to allow it, since it really isn't a very useful trick very often; however, it complicate things without adding very much, so I've changed my mind again, and I'm revising these cards to make my original intent the official version. As for that whole Play-Before-You-Draw debate, here at last is my final answer. You must follow the turn sequence established in the rules sheet unless a Meta Rule says otherwise. Which brings us back to the beginning. 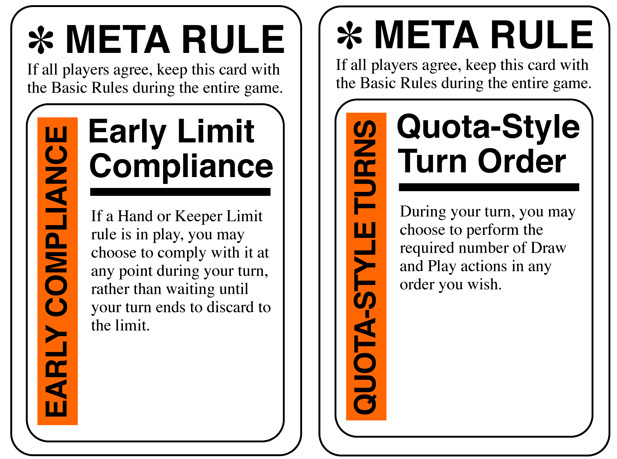 For anyone whose group likes to allow the option to Play before Drawing or who cares about the ability to comply with the Hand Limit early, you can still do so via Meta Rules, as shown here. As I said, we're in the process of developing a set of Meta Rules to include in a new product, and it's possible we'll decide to feature one or both of these cards in that set; but I've got other Meta Rule ideas too, so it's also possible that we'll never actually make these into real cards. So if you want to use them, feel free to print these images onto cardstock for yourself. (Click here for higher-rez versions). Thanks for reading, and have a great fortnight! It's been a hectic couple of weeks, but among other things, we got the Looney Labs office fully moved from Janet's Attic to Alison's Basement, we emptied out the storage space where we had hundreds of boxes of stuff along with our 7 machine video arcade, and we sent the card files for Monty Python Fluxx off to the printer. Thanks so much to everyone who helped us get all this done! To celebrate these many accomplishments, I bought myself an iPhone. Woo-hoo! Although Kristin tried really hard to make it happen, we've had to give up on the idea of making purple dice for Pink Treehouse. It's a long, sad story which I don't really want to get into, but suffice it to say that our previous dice supplier went out of business and no other company appears able to make custom-printed purple dice without doing a much bigger print run than we need, and of course, making them in China. So we're sticking with a standard color, and instead of expanding color options, we're reducing them: future production runs of Xeno Treehouse will also include black dice, instead of white ones. It's fascinating being a dog owner after a lifetime spent avoiding and disliking dogs. It's easy to see now, though, how I came by and maintained my negative attitude about them. Molly almost never barks -- except when she encounters a stranger, at which times she can carry on with amazing ferocity, considering how sweet she is otherwise. So if the only encounters one ever has with dogs is when they're treating you like a stranger, you're bound to get the wrong idea about them.